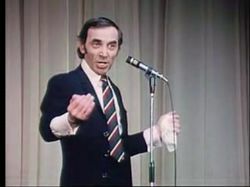 Aznavour performs one of his most famous songs, "La Bohème", at the Paris Olympia in 1968. Charles Aznavour was a French-Armenian singer and songwriter, often compared to Frank Sinatra. Aznavour was born Shahnour Varenagh Aznavourian in Paris, the son of Armenian immigrants. At an early age, his artistic parents introduced him to the world of theatre. Charles Aznavour aisle at the Ararat Brandy Factory. One of France's most popular and enduring singers, he began to perform by age nine and soon took the stage name Aznavour. His big break came when the singer Edith Piaf heard him sing and arranged to take him with her on tour in France and to the United States. Often described as the "Frank Sinatra of France", almost all of Aznavour's songs deal with love. He has written more than a thousand songs as well as musicals, made more than one hundred records, and has played in sixty movies. Aznavour sings in five languages and is the most well-known French singer abroad, performing at Carnegie Hall and other major venues around the world. Charles Aznavour statue in Gyumri. In 1996 Charles Aznavour was inducted into the Songwriters Hall of Fame. A lover of Quebec, he helped the career of Quebecois chansonnier Lynda Lemay in France, and has a house in Montreal. Aznavour starred in the 2002 movie Ararat playing Edward Saroyan, a movie director. Charles Aznavour, the world-famous French singer of Armenian descent, has revealed that he was offered to become Armenia’s ambassador to Switzerland and nearly agreed to take up the vacant post. President Serzh Sarkisian granted Armenian citizenship to Aznavour in late December. The Swiss-based singer already received Armenia’s highest state award, the title of “national hero,” in 2004 in recognition of his long-standing support for the country of his ancestors. A square in downtown Yerevan was named after him in 2001. Aznavour, 84, is one of the most renowned members of France’s influential Armenian community. He was at the forefront of the community’s efforts to help victims of the catastrophic 1988 earthquake that devastated much of northern Armenia. This article is Copyright © Radio Free Europe Radio Liberty (RFE/RL), all rights reserved. Used with special permission, granted to Armeniapedia.org. RFE/RL can be found online..
Gibrahayer e-magazine - Alexander-Michael Hadjilyra - After a concert he held in Moscow, Charles Aznavour confessed to reporters that his country, Armenian, commits "internal genocide" and that the authorities of Armenia don't allow the country to breath and they deprive it of its youth, which leaves the country in despair. Aznavour said that this is not a political problem, but a human one and it needs to be addressed and immediately resolved. Being Armenia's Ambassador to Switzerland and UNESCO, many thought that he would either resign or be relieved of his duties; however neither of these happened. In an interview with “Life Showbiz” magazine, Aznavour lamented about the domestic socio-economic situation in Armenia and used the opportunity to blast the Armenian authorities. “My country is now experiencing domestic genocide. I consider it to be politically unacceptable. “Not letting Armenia breathe, the government is depriving its own country of its youth, forcing them to leave. And in that respect, the issue has ceased to being only political, it has taken on a universal dimension. It has to be solved,” said the 87-year-old singer. He also added that he did not like politics since that is not his calling. “I like the arts,” he declared. Yerkir Media asked the foreign ministry spokesman Tigran Balayan for a comment on the Armenian Ambassador’s remarks but was turned down. YEREVAN (PanArmenian.Net) - Charles Aznavour’s house-museum opened in downtown Yerevan on June 1, in a solemn ceremony attended by the legendary singer, his son Nicolas Aznavour, President Serzh Sargsyan and a number of guests. Minister of Culture Armen Amiryan handed the symbolic keys to the museum to Charles Aznavour. The ceremony also marked the launch of the Aznavour Foundation aiming to preserve the maestro’s cultural legacy. The foundation will also develop and implement educational and social programs. “All of our joint efforts should be targeted at the development of Armenia to enable the youth to realize their dreams in the country, surrounded by their loved ones,” Aznavour said. The singer noted that his decision to establish the foundation was prompted by seeing brilliant educational programs implemented in Armenia, historic monuments restored and new infrastructures created. “Aznavour is truly a legend, a legend that belongs not only to France and Armenia, but also the humanity at large,” he added. This page was last edited on 18 April 2019, at 21:01.